Most all railroads have well recognized colors that their locomotives and rolling stock wear. Some have endured longer than others. The Union Pacific's yellow and gray has been around it seems forever, while mergers have obliterated others like the SP's "bloody nose". And who can forget the famous "Black Widow". Closer to home on the Santa Maria Valley Railroad, the diesels have worn a number of color variations that may surprise some of you. Most are familiar with the yellow and green stripes. It may surprise you to know that there were two color schemes prior to the one the GE locomotives now wear. The first five locomotives ordered new from GE were delivered sporting a dark green background on the cab, hood and frame. The frame was set off by reflective caution stripes and the pilots had caution stripes that were a silver/white against the green. 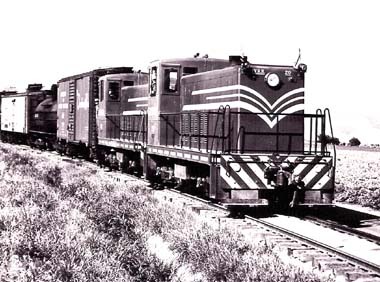 GE had a stripe design that was used on several locomotives put out by the company. 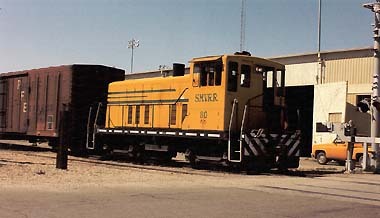 This stripe pattern was in yellow on the hood and the road’s initials and locomotive number were also stenciled on the cab below the windows in yellow. The trucks were black. The locomotives were repainted in the late fifties and it would seem that they were before the original colors had weathered much. The SMVRR has the luxury of having always had adequate shelter for its locomotives and so they never stood out in the weather. The colors were reversed, making the locomotives much more visible. The background color of the hood and frame became yellow and the stripes green. It was not until subsequent repainting that the frames became black with silver caution marks and black and silver striped pilots. As the black frame appeared as early as 1962, the last green units no doubt were painted with the black frame. In the late 1980s, the Holly Sugar Company absorbed Union Sugar and put larger five bay steel hoppers into use. The SMVRR then MUed three 70 tonners to handle the thirty car trains from Barsug to Betteravia. After assurance that the Betteravia operation would be long term, the SMVRR made plans to upgrade the locomotive roster to the more powerful GP- type locomotive which was as powerful as three of the GE units. The first one arrived in December of 1992 and two more were planned. 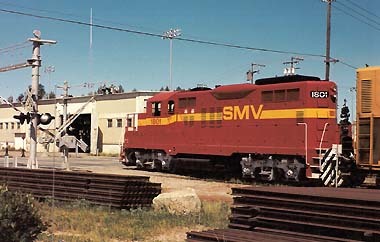 The locomotive arrived with red as the background color on the cab, hood and frame with a broad yellow band on the hood broken by the large initials, "SMV". The trucks are silver and the pilots are black and silver striped. Two alternative schemes considered were the yellow with green band and the original road colors of green and yellow band. The red and yellow was to be the new look of the SMV. All of the GE locomotives would have been disposed of in the program. Holly closed the Betteravia plant in the fall of 1993, and so the railroad abandoned the upgrade program. Had management been kept appraised by Holly, the 1801 would not have been purchased. 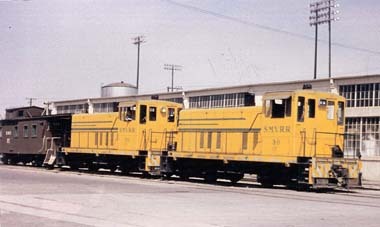 The present roster consists of two GE 70 tonners, Nos. 70 and 80, which wear the yellow; and the GP-9, No. 1801. There are no plans to paint the 70-tonners the red and yellow. Circa 1949 and units 10 & 20. The units were at first MUed as shown, but in later days the railroad preferred to combine them back to back. Note the headlights, pilot foot boards, white flags, marker lamps. Also note that the Hancock air horns have not yet been installed. I am told despite the name there was no connection to Capt. Hancock, then owner of the road. Units 20 & 30 with the first yellow scheme. The headlights have been upgraded and the Hancock air horns installed. For those of you that may not know, the horns had the haunting sound of a real steam whistle. The caboose is still red with green window frames. Number 80 at Miller Street. The frame is now black, and the footboards gone. By now all the locomotives were equipped with bridge plates between units when Mued. Newest member of the fleet, the GP-9, 1801 at Miller Street. There were to be two more similar locomotives and this was to be the new look of the roster.